To date, the callers have alleged that the call recipient is delinquent in payment of a loan that was applied for over the Internet or made through a payday lender. The loan may or may not actually exist. The caller attempts to authenticate the claim by providing sensitive personal information, such as name, Social Security number, and date of birth, supposedly taken from the loan application. The recipient is then strongly urged to make a payment over the phone to “avoid a lawsuit and possible arrest.” In some instances, the caller is said to sound aggressive and threatening. 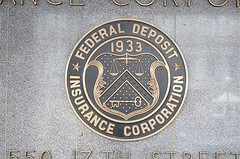 The FDIC generally does not initiate unsolicited telephone calls to consumers and is not involved with the collection of debts on behalf of operating lenders and financial institutions. In short, if it’s a phone call, hang up. If it’s an email, don’t click on anything and delete the email. Then go through your bank and credit card statements to make sure you aren’t already facing an identity thief who is trying to gather more data on you. If you find out that you’ve been swindled already, contact your financial institutions immediately.